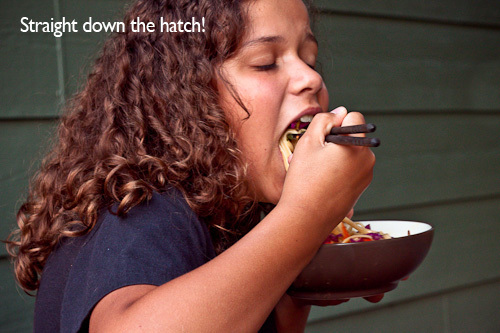 My daughters ate raw cabbage and bean sprouts this weekend because I have a food blog. There is no other explanation for it. Sometime after they started walking and before they lost their first baby teeth, my girls decided to complicate my life by becoming carbotarians. The only foods that could make it to the table without shrieks of protest were those that used to be grains in a former life. Bread, rice, cereals and pasta, our food pyramid was more like a straight line. Through sheer force of will, years of persistence, nagging, threats and yes, even bribery, we have reached the point where vegetables, meats and fruits get eaten with limited objection, for the most part. I’ve made this noodle salad many times before, and each time I was gently but firmly reminded that while peas and carrots were acceptable in moderation, the cabbage, bean sprouts and green onions would be vetoed immediately and without mercy. Because they otherwise adore this salad, because I strive to maintain family harmony, and because I totally caved in to them, I would make a half recipe “big people” version, and a half recipe “little people” version. Until this weekend. The following pictures of my youngest daughter depict actual events and are not a recreation. 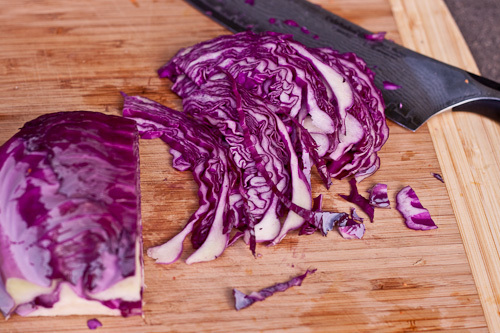 Photos of raw cabbage being consumed. Viewer discretion is advised. This weekend I learned something very, very interesting; if I want my children to eat something without protest, all I have to do is blog about it. I must take lots of pictures, ask them to help set up the shots and make the food, all without ever hinting at the fact that the dish we are making is loaded with veggies they think they hate. Maybe I should write a book: “Blogging Away the Picky Eater”. Except for the fact that all I have to offer is the catchy title. I have pretty much zip in the way of actual content. Not that that’s ever stopped anyone before; like former presidents and aging child actors, for example. There is something wonderful that happens in your mouth when Asian flavors like soy, ginger, sesame and garlic combine. The trendy word for it is umami, but since I’m not very trendy and probably couldn’t pronounce it right if I tried, I’ll just call it yummy. Add some fresh tang from the lime, a bit more than a hint of sweet and hot from the honey and chili oil, and the resulting dressing could probably make cardboard taste gourmet. 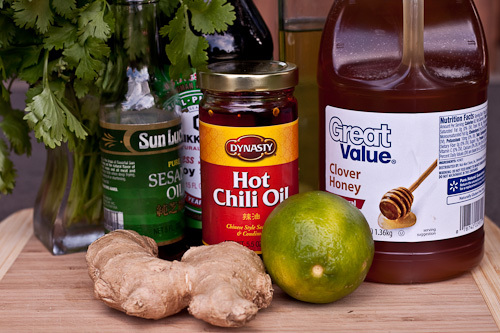 Don’t limit yourself to salad either; the dressing makes a great marinade for chicken or pork. Cook the linguini according to the package directions, drain, and rinse with cold water. Allow to drain completely. Put all of the dressing ingredients in a blender and blend until smooth. Adjust for heat with the chili oil according to your taste. Combine all of the salad ingredients in a large bowl. Add dressing and mix well. Taste for salt and adjust accordingly. Serve at room temperature. I’ve made something very similar, but I used glass noodles instead of linguine. Interesting choice. Very well done–I don’t think I’ve ever heard the term carbotarian…I think you are on to something with your “blogging away picky eaters” idea. Your opening photo of the salad is really nice. Mmm, looks great. Fresh and delicious! I’m interested in anything that gets through the guard of picky eaters! I love noodle salads and this looks great. I love all variations of this salad! I eat it for lunch at least 3 times a week… and it’s great with soba noodles in place of linguine! BeardofPants: I’ve made it with rice noodles and with Soba, but the girls prefer the linguini. It works with all of them though. The Klutzy Cook: Me too. I’m so glad there are getting older and getting over the whole picky eater thing! Cate: It is, and with rice noodles too! ok – is carbotarian really a word??? LOL – you are too funny, I like your sense of humor. Recipe looks great, as always great photos. I will make this soon. Karen, this look great, can’t wait to try it! (and I can use my Kitchenaid to make the linguine. Thanks for visiting my blog, I have had my Kitchenaid for over 15 years, my daughter is trying to convince me to get a new one and give the old one to her, it is just too hard to part with an old friend! Oh wow that looks soooooo good! That noodle salad looks really good and the dressing sounds tasty! Just found your blog through Foodbuzz. This Salad is fabulous and I love your header. So cute!! Shari: I’m glad you enjoy the site, and I hope I can keep you entertained! Someday I’ll have my kitchenAid. It just keeps getting pushed down on the list of things I really need to get, like clothes, food, etc 😉 Though it’s one of those investment items that you pay for, but have around forever after that. Gina: It is! I make it quite often. Kevin: Thanks! It makes a pretty good marinde too. theUngourmet: Thanks, and I hope you come back to visit often 🙂 The header picture is courtesy of my husbank who felt both bored and creative one evening! Jessie: I agree, the colors are great. And feel free to add any other veggies you have lying around, maybe some baby spinach for a dose of green and extra vitamins. This looks very good, my toddler son is also a carb addict! He will love this dish! He’ll eat anything as long as their is pasta, rice or cheese involved. He use to eat pasta or rice dishes till it came up. I learned to take the food away when he starts to slow down. He’s crazy! 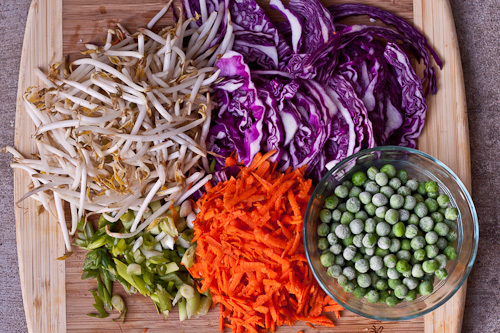 The colors are so stunning and the veggies so fresh, it’s making me envious that I can’t dig in too! 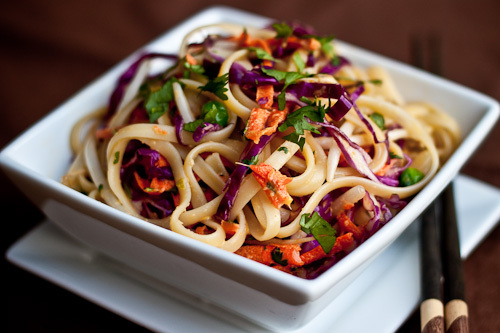 Very nice and healthy:) I love asian noodle salad. I love to eat it cold sometimes. So refreshing. LOL Now is that the secret to cure picky eaters is to take pictures of them to get them to eat my cooking? I love the colorful pictures of the veggies. So did your daughter end up liking this? The recipe sounds very interesting. YUM! Love your pics! Healthy and light! I will for sure be making this sometime soon. Maybe I will post it on my blog, I will send people your way if I do! Southern Grace Gourmet: Well that sounds familiar! Stacie: Yes, she did. She loves this salad, but this is the first time she loved it *with* the cabbage. The first time I made it, I didnâ€™t add any veggies. I do this when I want to introduce them to a new flavor without the veggie distraction. After they decide they loved it, I add in the veggies. Another great way to get kids to try new food is props . They each have their own set of chopsticks that we get out anytime we serve Asian, and when I do Indian or other Middle Eastern food, I usually let them eat with their fingers. Making it special and different helps to get them to try new things. 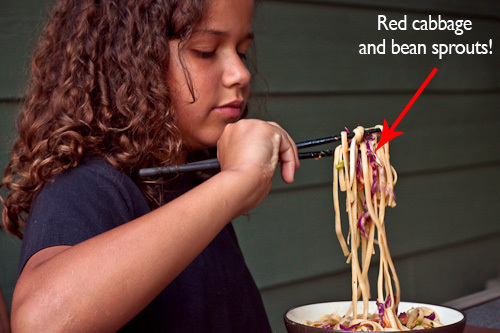 I can’t believe the girl in the picture eating the recipe! Lol, is that who we think it is! Tell her she is awesome, another great recipe to try for the family. Looks amazing. This looks and sounds delicious! I’m so glad you had an email “screw-up” and this got re-emailed again. I was not a follower and missed this when you first posted. I’m making it soon!